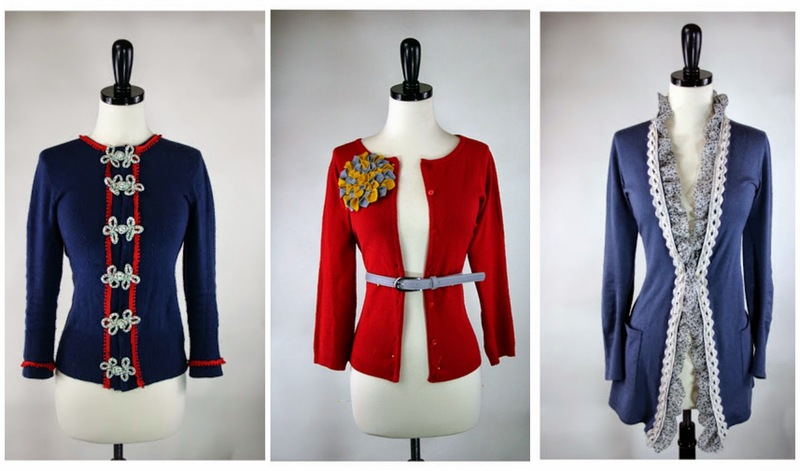 Today I want to show you my favourite selection of refashioned sweaters. I have sorted out our clothes, preparing the wardrobes for the seasonal change and decided which ones to keep and which have to go. 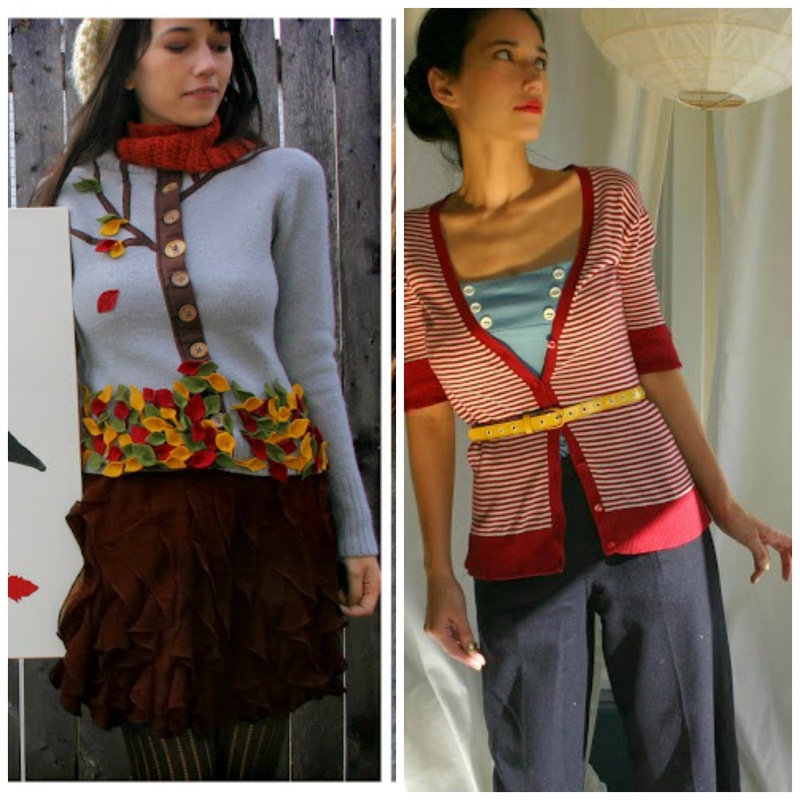 I give away our sweaters with a heavy heart and see first if I can re-use / repurpose them first - that is if they are in a wearable condition. Here's a selection of 12 projects I am totally in love with and what I will use as inspiration to change ours. 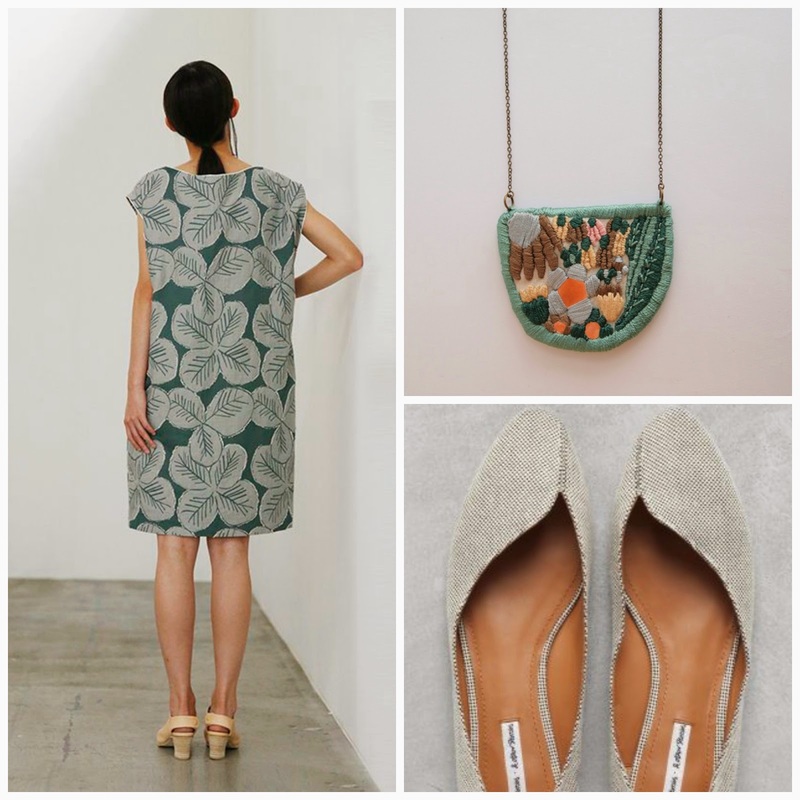 Enjoy and refashion! 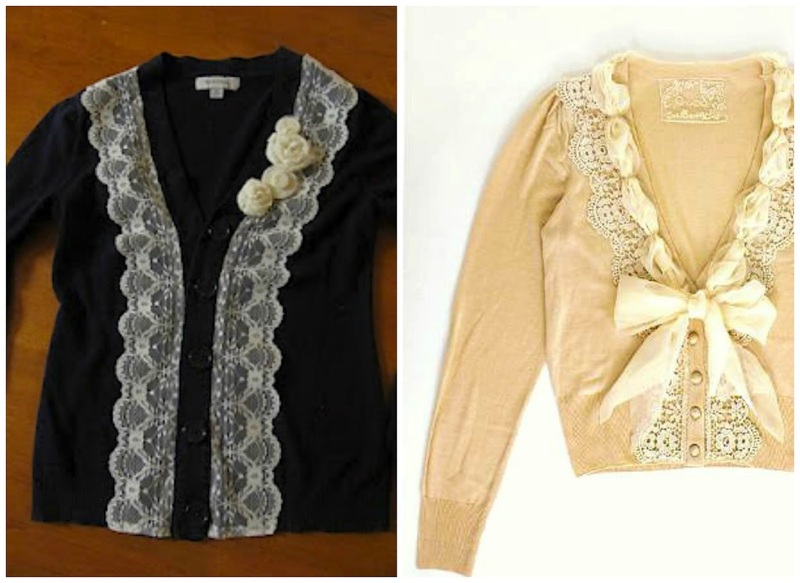 The two boards below show Kathleen's sweaters. 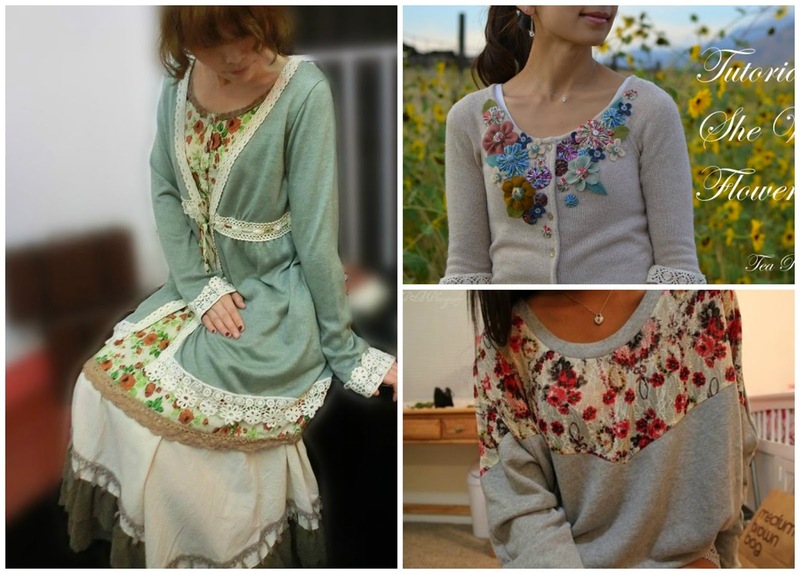 She had a sweater embellish month years ago, I still cannot take out of my mind. Click on the link below to see all her 30 refashions. Hi there! 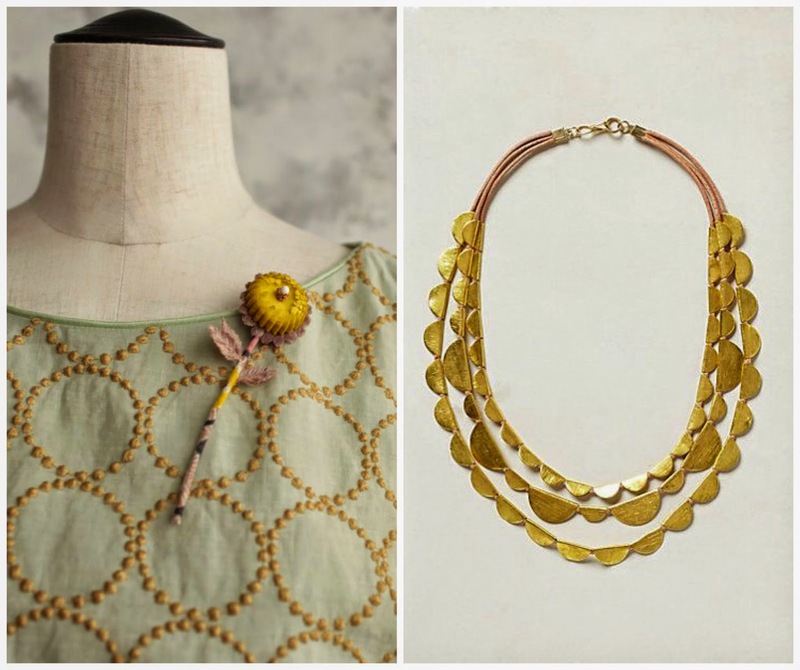 Today I am sharing some sparkles with you to lift spirits up. 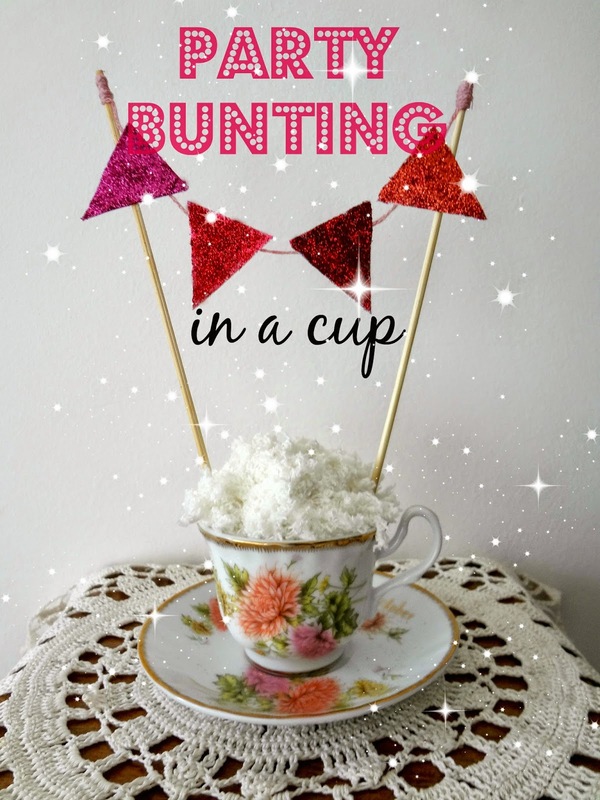 For Eva's birthday I made this heavenly easy party bunting (in a cup) and just as cute. You will also need glue (and a brush). 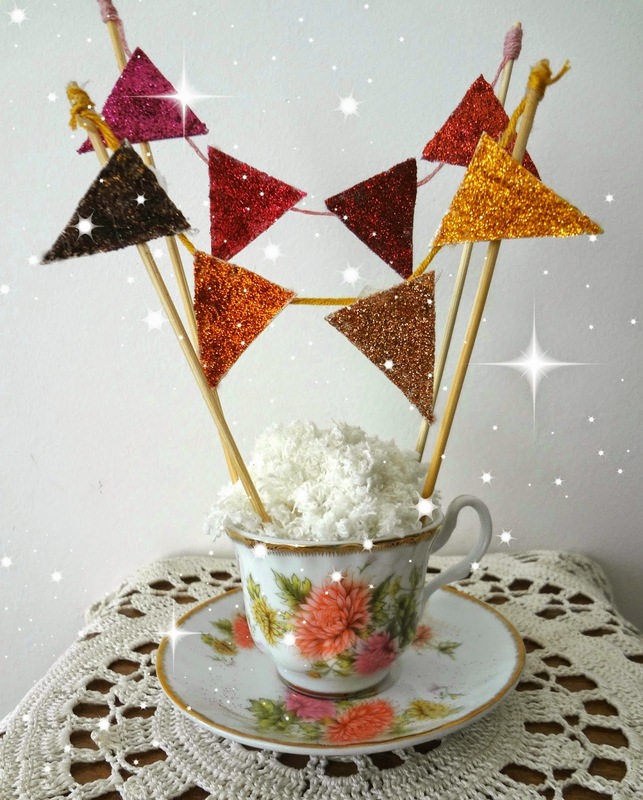 4) Add a dab of glue on the stick and roll the thread around it and work on the tension you like for your bunting. Do the same on the other side. 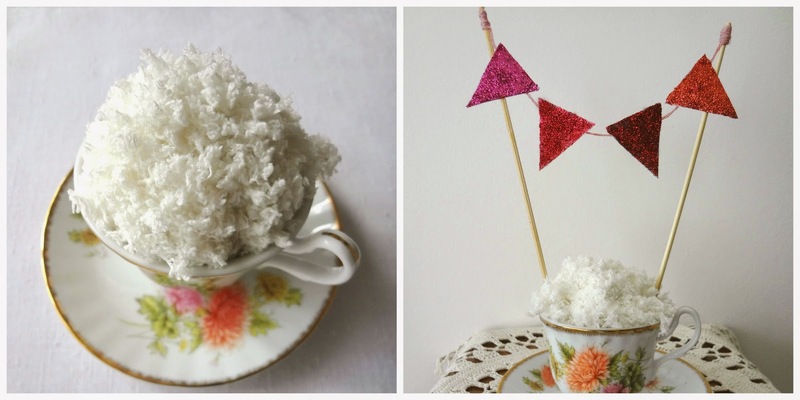 Put (stuff) the ball of yarn in the cup and then insert the sticks. If they are too big, cut them at the base. 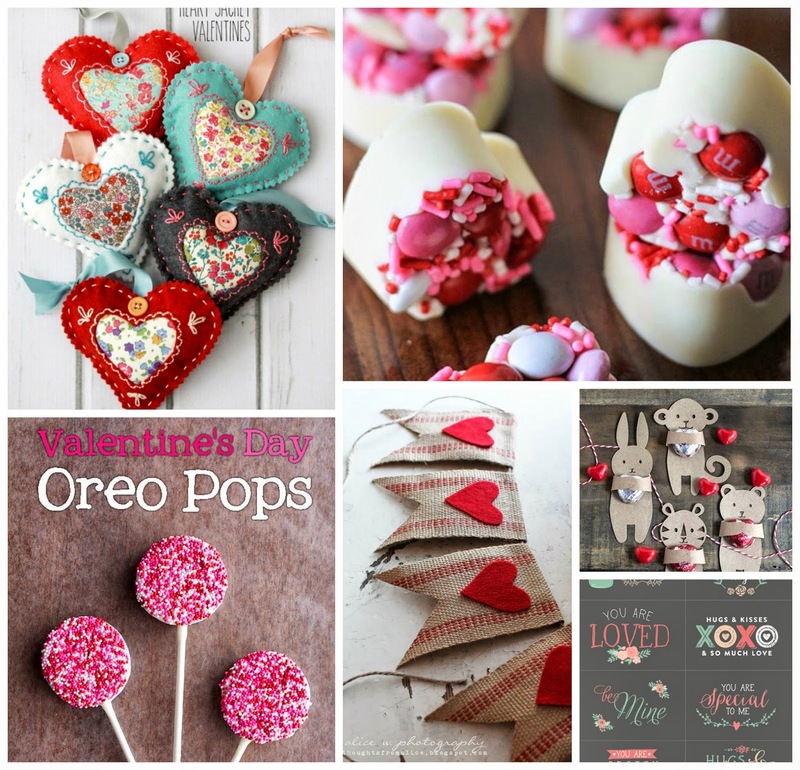 My current mood boards I made for inspiration. Between two crochet sessions I throw in a quick stitch or two. What's this about? I am working on an embroidering project that uses the above color combinations. Actually, flowers I am making for my necklaces. So far it is lots of fun! It may seem that I have laid down my hooks and having a break, but that can't be possibly farther from the truth. I have been working like crazy and to tell you the truth I've accomplished so much in the past week than in the past few months. The reason for this is that I will be having an exhibition of the Romantic Mori Collection soon. 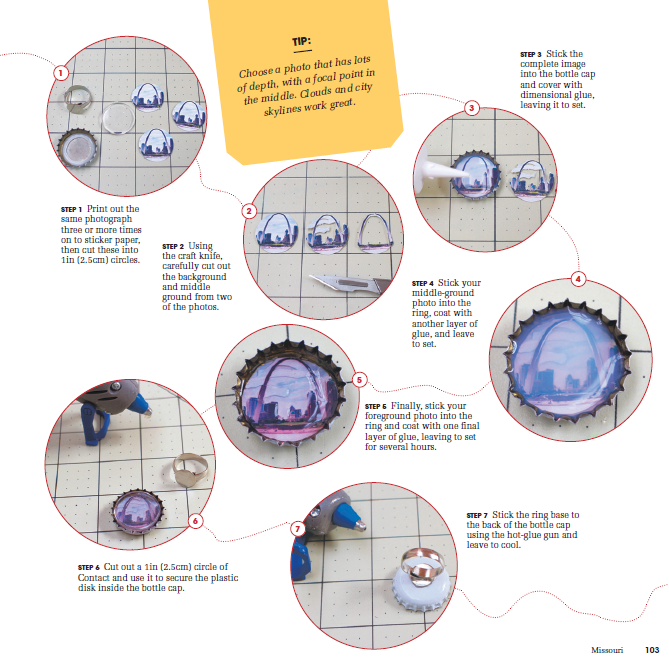 As I mentioned a couple of days ago, wonderful Cat of Cut Out + Keep is promoting the release of her new book and as a gift she offers this superb tutorial for making a bottle cap ring. This is a unique way of showing off vacation snaps. So let's begin! 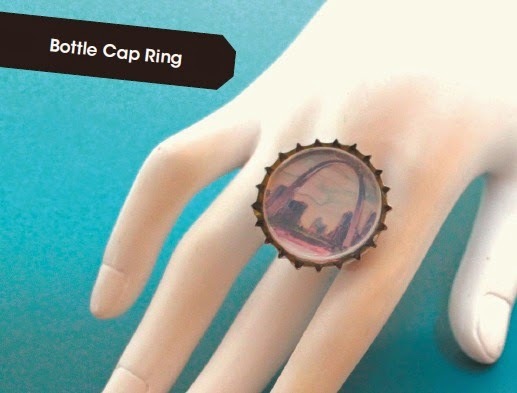 For my bottle cap ring, I used an image I cut out from vintage paper and since I didn't have any dimensional glue at hand (but was itching to try this myself right then) I used liquid silicone glue which took ages to dry and when it did it left bubbles inside. However, I think the bubbles add it up to the cuteness and I love how it turned out. 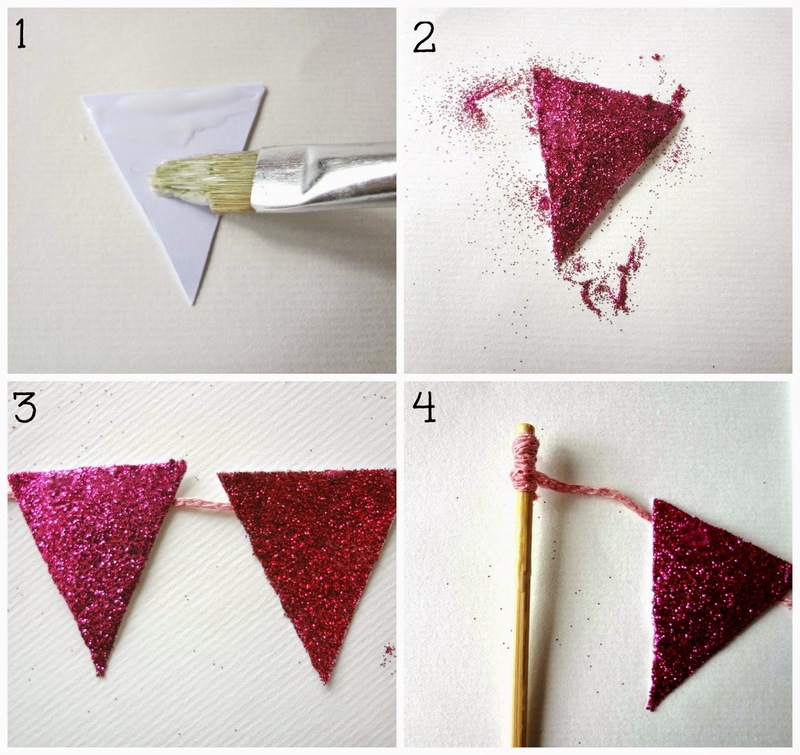 Next time I try this, I would use dimensional glue for neater effect! Thank you Cat for letting us use your fantastic tutorial! 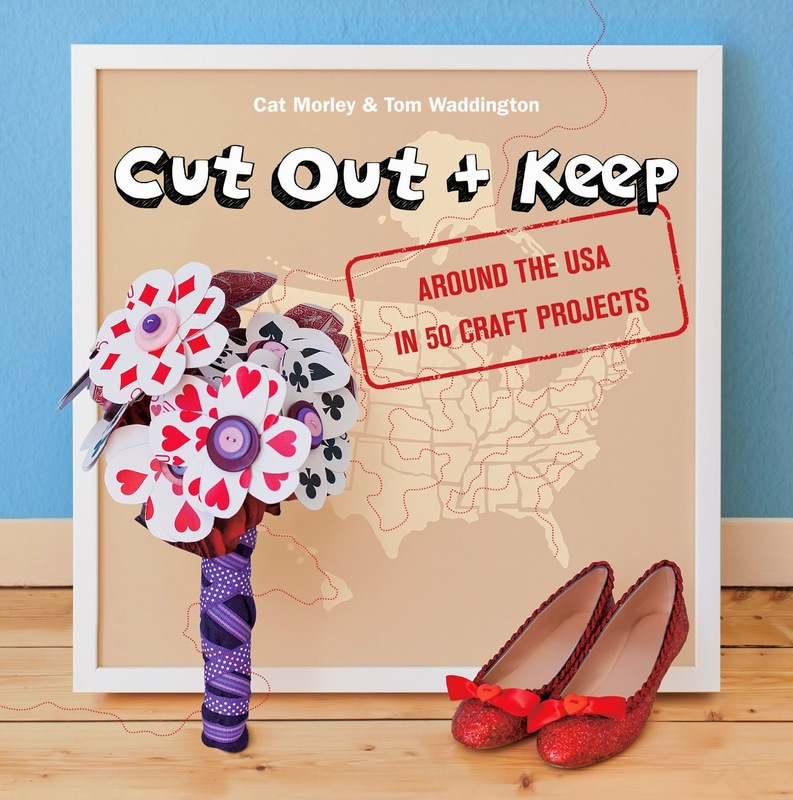 Wonderful Cat Morley and Tom Waddington of Cut Out + Keep set off around the USA, visiting the 50 states following tips and recommendations from visitors of their site to travel, taste, experience the distinctive history and culture of each state and create a project for each and every one. Here's how Cat describes the extraordinary experience: "We asked for your suggestions, we slept in quirky motels, we ate gigantic portions of local food and we drove from coast to coast in America to see all 50 states, stopping at off-beat, crazy and crafty sites along the way. Inspired by our travels, we tuned our adventures into a book with 50 step-by step tutorials to make a souvenir for each state. 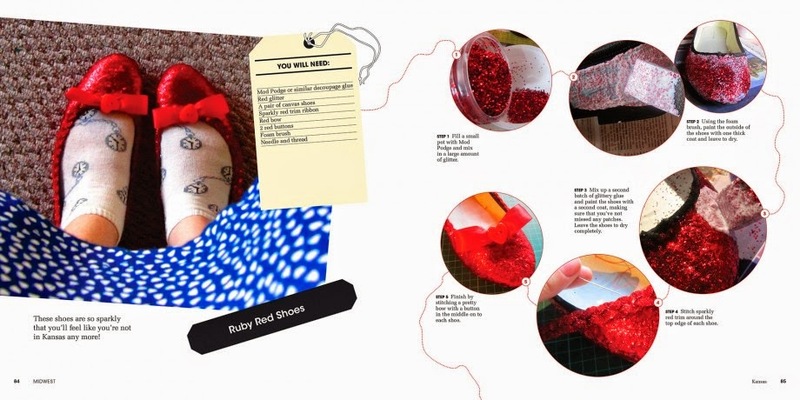 Make a pair of Ruby Red Shoes for Kansas, a Licence Plate Notebook for Michigan, Hollywood Lampshade for California and bake a batch of UFO Cake Pops for New Mexico." In order to celebrate the release of the book, Cat generously shared a bottle cap ring tutorial, so come back later to see it. Cat Morley started Cut Out + Keep as her craft blog while still at university.In 2007, with her partner Tom Waddington, she turned the blog into a community website (www.cutoutandkeep.net) to which any member can submit craft projects. The website receives a million of visitors a month and now keeps them both busy full time. On the 14th, my Valentine girl had a Champagne Birthday. Champagne Birthday is the birthday on which you turn the same age as the day you were born. 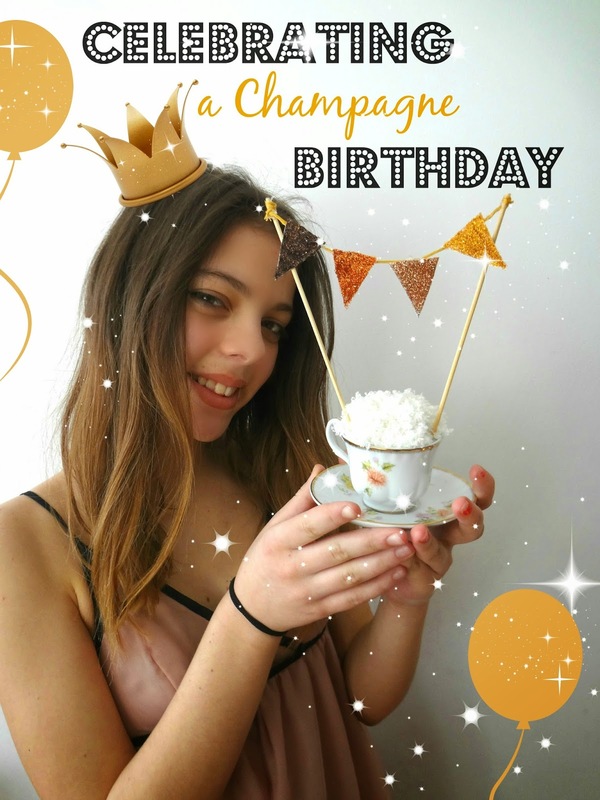 Soon after I started blogging I came upon a blogger who had a champagne birthday for her boy. Of course I had no idea such thing existed but I liked it so much, I promised myself I won't forget and have champagne birthdays for my children. 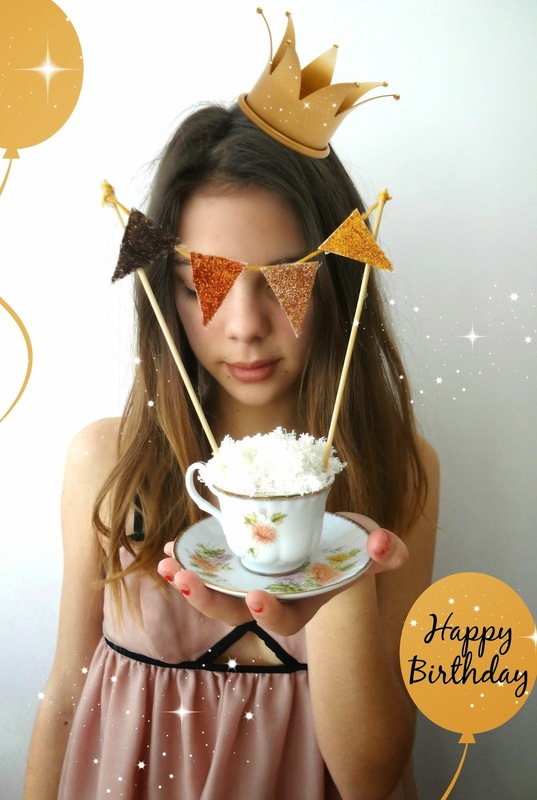 And before I know it - she turned 14! This is a project I have had on my mind for a long time and now I am glad I did it. The buttons you see here are the most favourite in my vintage button collection - they are all very old with the exception of 2-3 of the small buttons. 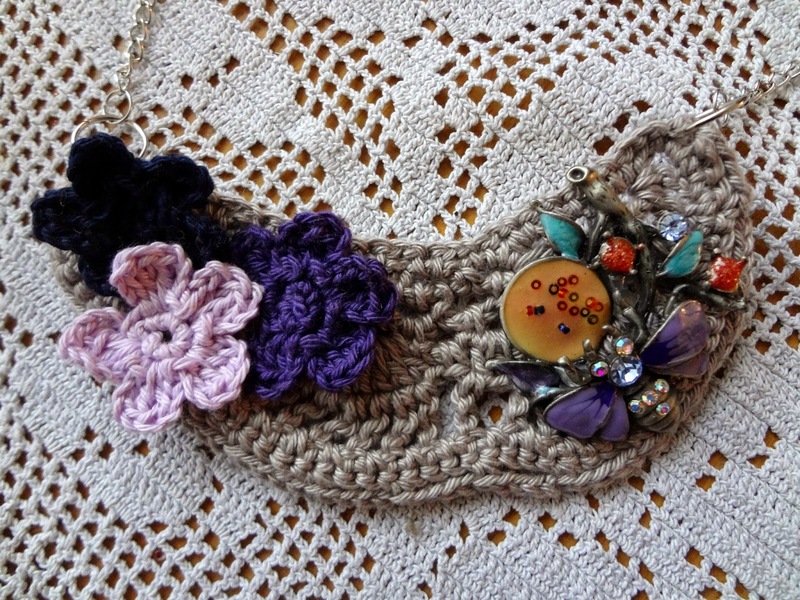 I have long wanted to use them in a project and I believe this brooch is a fantastic way to display them all in one place. 1. 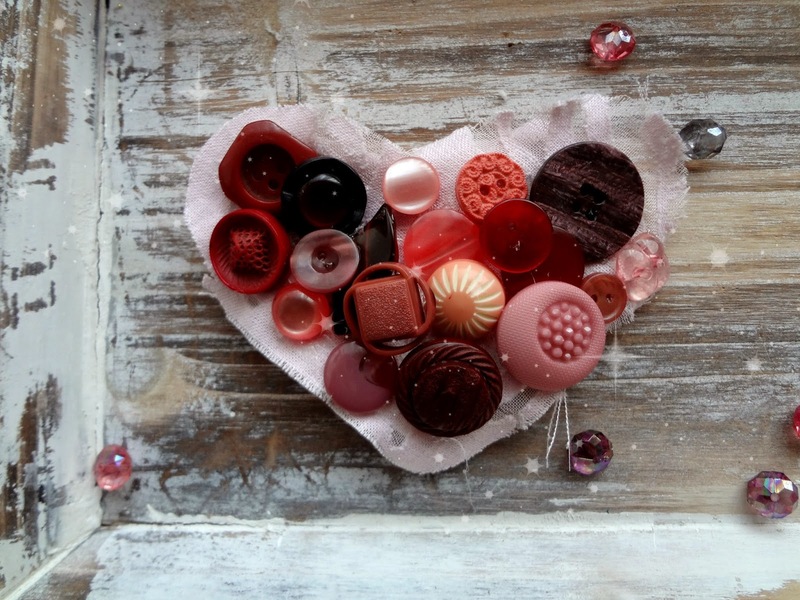 Collect buttons you want to use in this project. Put them on a piece of paper. 2. 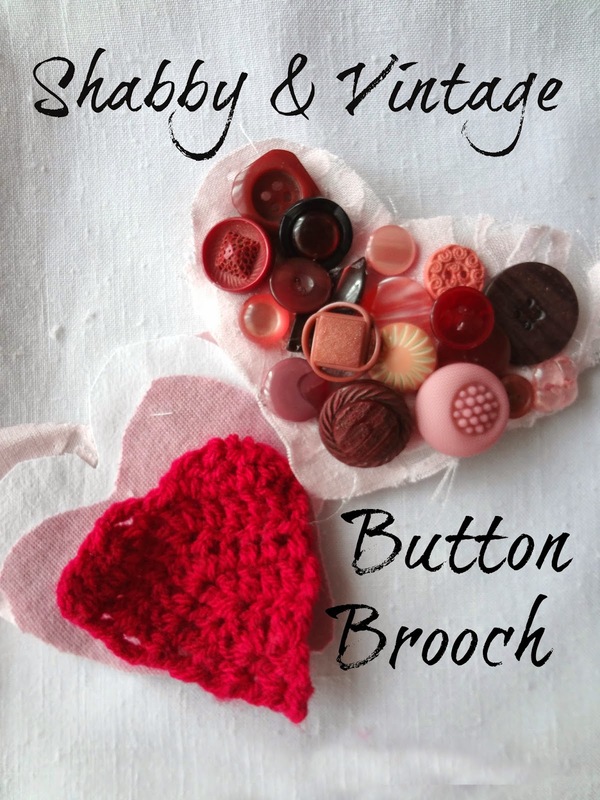 Draw a heart or any other shape you want the brooch / patch to be. I made a provisional design here - as you can see from the final version - I have changed the position of the buttons. 3. Cut the drawing, place it on fabric and cut it out. Since my buttons were heavy gathered together, I cut 4 pieces. I planned the pinks to be on the outside. 4. I sew the pieces with the faces inside, left a hole to turn the heart inside out and at the end sewed that hole up. 5. I cut out another heart shaped patch and glued it onto the top. 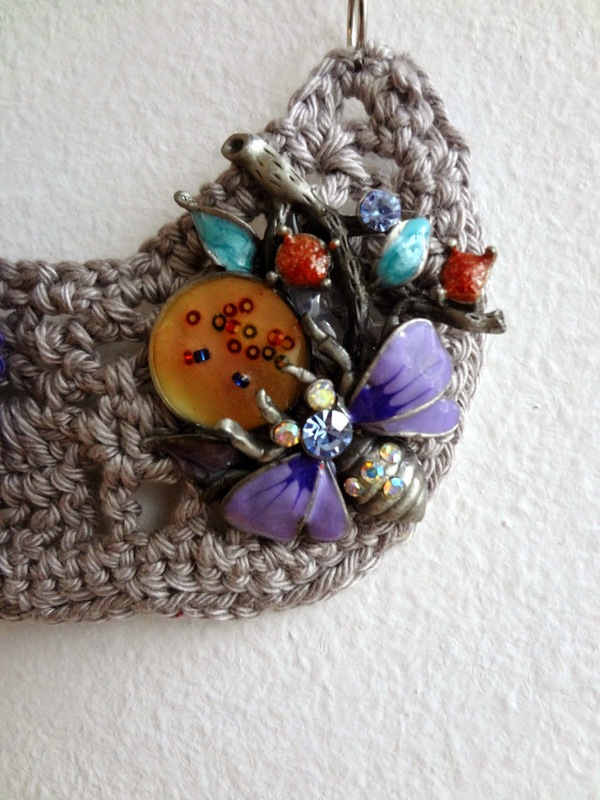 I wanted a shabby look for my brooch so I left it fraying. 6-6a. I glued the buttons on top of that patch. 7. I glued a brooch pin at the back. That's it! A week ago I was babysitting my niece and "helping" me she saw my crocheted flowers and fell in love with them. On the spur of the moment I decided to make a headband for the heart. 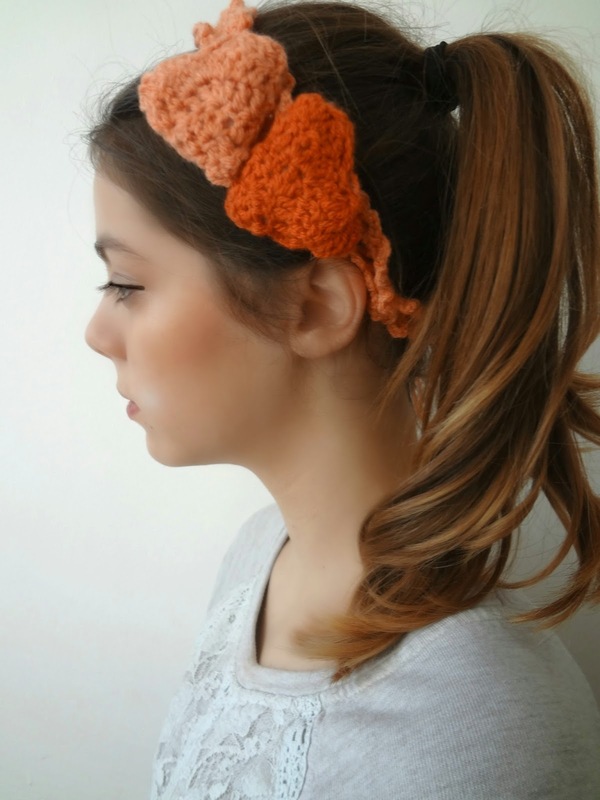 To make the thin headband, with DC yarn and 3.00 mm hook, chain 90. Starting from 2nd ch from hook, make 1 hdc, skip 1, chain 1 and hdc in the next. Repeat this pattern until the end. When you come to the end, chain 4 and sl st between 2 hdcs. Chain 4 and sl st between hdcs to the end in the round, so that both sides have these 4-chains. 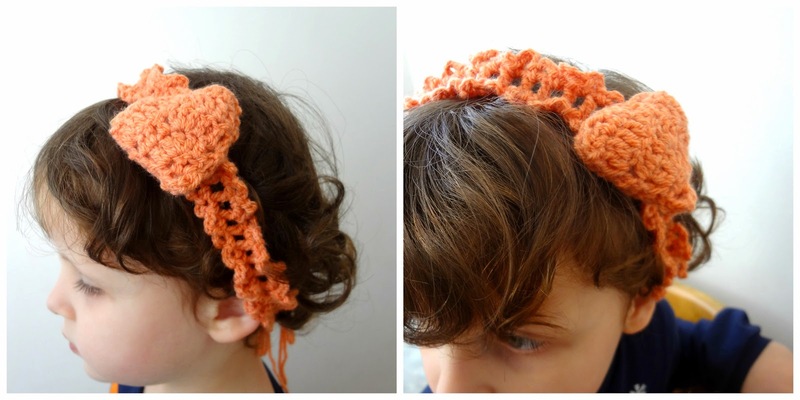 Add a chain at the sides for tying. For the heart in the pictures I used this pattern, or you can use this one or any other you find on the internet. 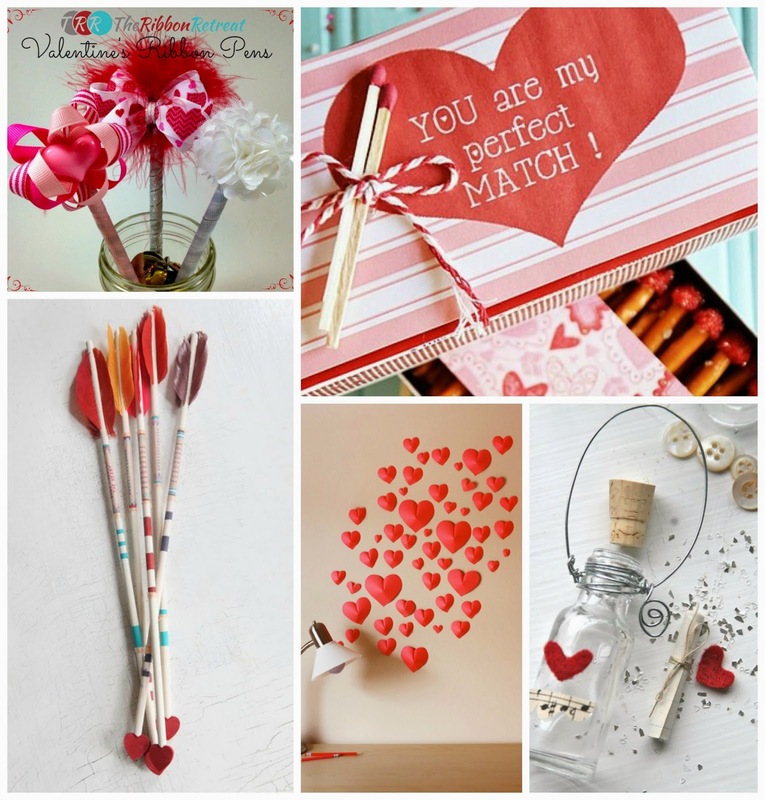 With Valentine's Day nearing by, I have made selection of 15 fantastic and easy Valentine projects. 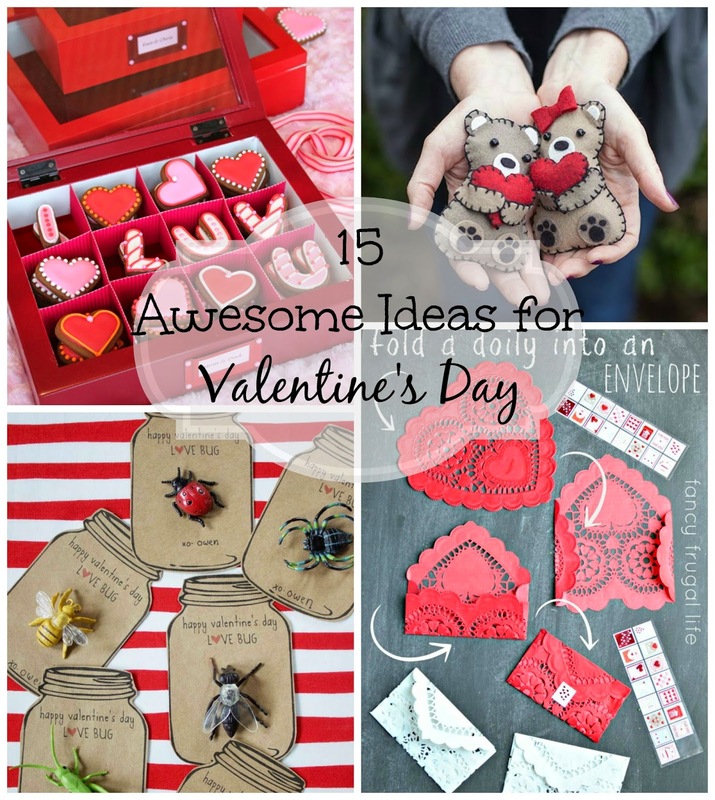 Some of these are old some are new, but they are all enticing and definitely worth trying. Enjoy the selection! Love Bugs by Dandee Designs. Wish Jars by Blog Crescendoh. Hi there! 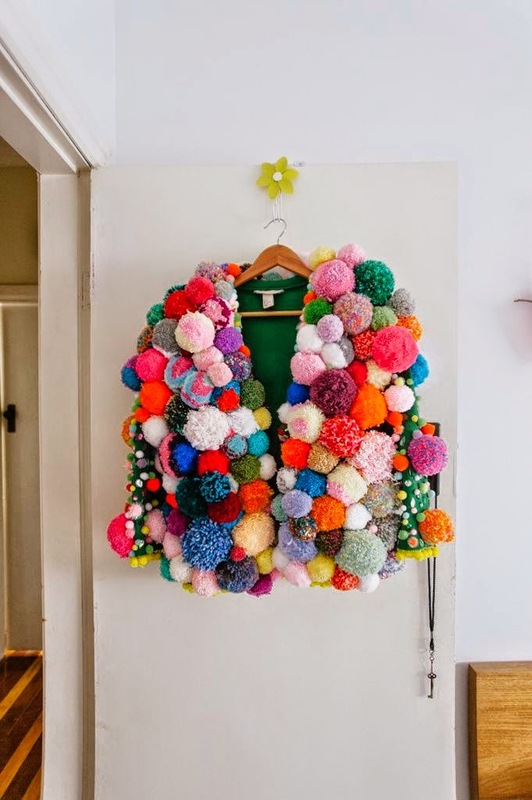 If you thought we were done with the pom-poms, you were wrong. 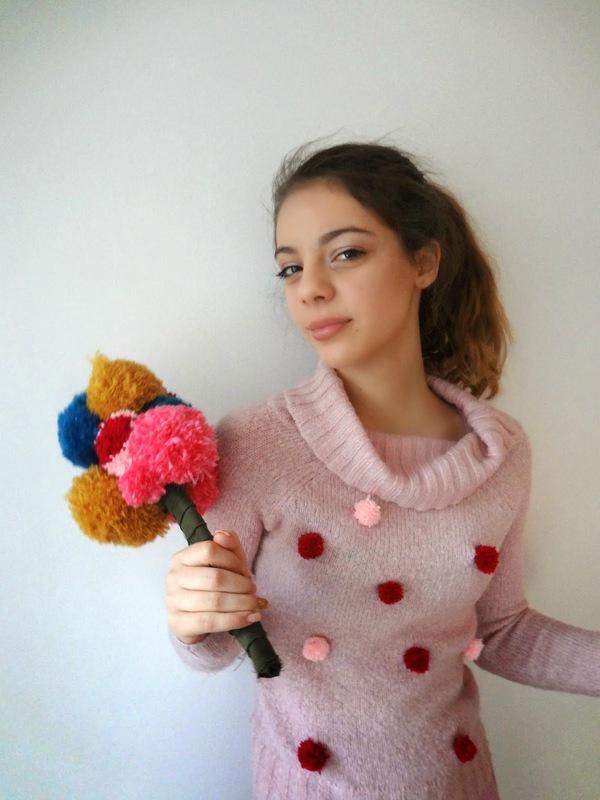 Here we are with another thing we tried - a pom pom sweater. 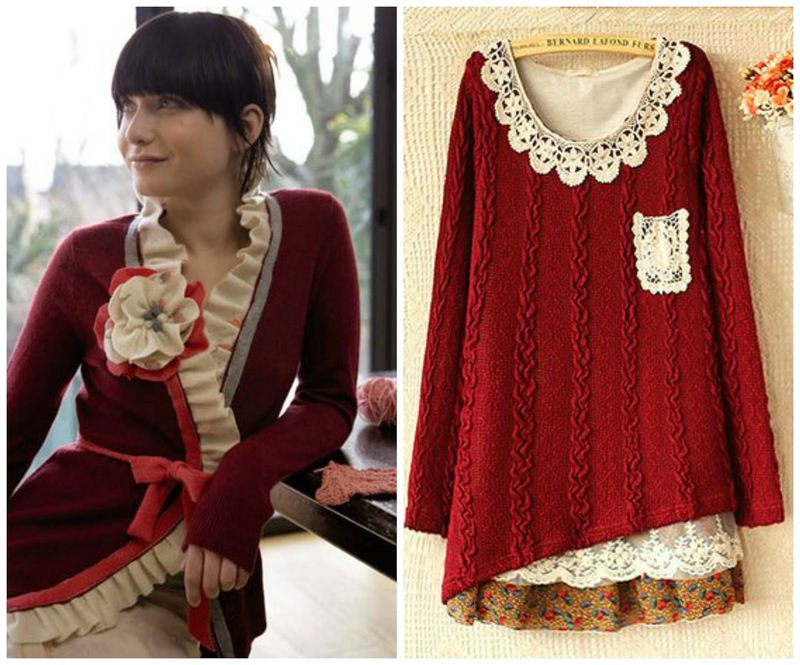 This is a lovely woolen sweater Eva got from my sister and she wears it a lot. So when we brainstormed ideas of which one of her sweaters would be suitable for this project, we both agreed on this one. 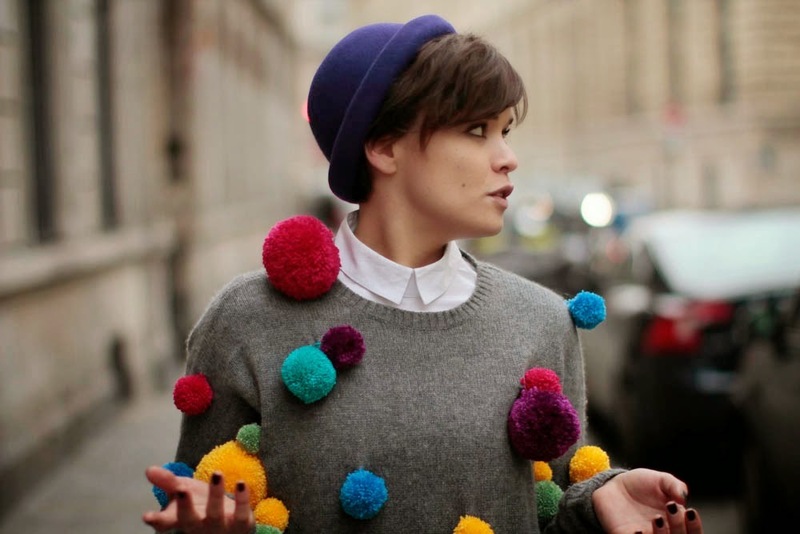 We checked the internet for some ideas and we chose to make tiny poms to decorate the sweater. 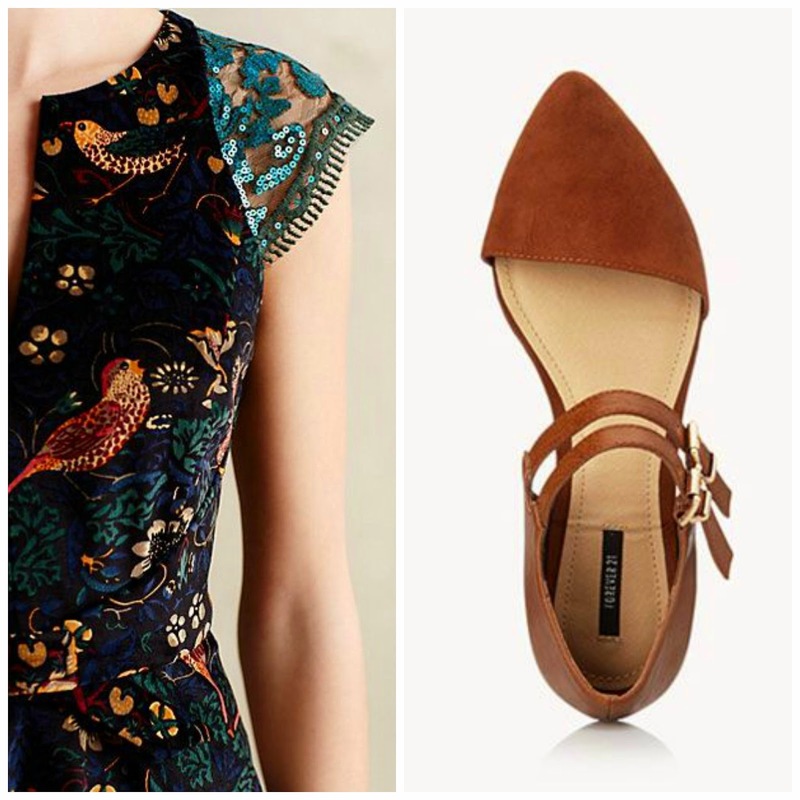 Below, you can find a motley selection that might be your inspiration. A bit subtle versions of the idea. This is what we used to make ours.